Hello, hopefully this post will finally make it into print; I originally forgot to take photos and had given this set as a little thank you gift. Luckily the recipient brought the set into work enabling me to get a couple of photos, so a huge thank you Danusia. ...and lost all of the text. C'est la vie! 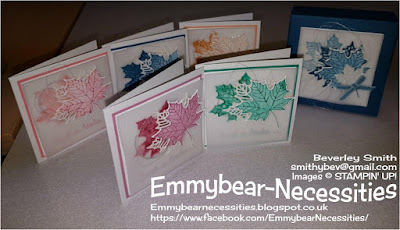 Those of you who take the time to read my blog will know I have a penchant for 3"x3" cards and boxes to keep them in. They really do make lovely little gifts for people. For this set I used the 2016 - 2018 In Colours. 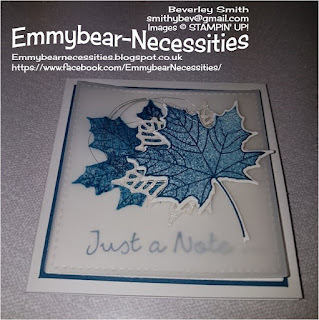 My design was inspired by note size cards I'd made at a Coffee and Cards session with Susan aka Craftyduckydoodah. using Colourful Seasons. 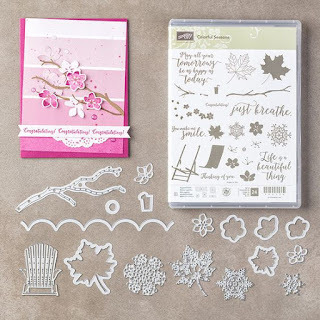 This set is fabu;ous as it really does do what it says on the box and cover each season. If you can only get one stamp set, this is the one and if you buy it as a bundle with the corresponding dies you makine a saving of 10%.We all love a bargain. I just thought that with some tweaking here and there the design would fit perfectly onto a small square card base. I used a white card base and matted and layered in both my chosen colour, Whisper White and vellum. I cut the Whisper White and vellum using the largest square from the Stitched Shape framelits. 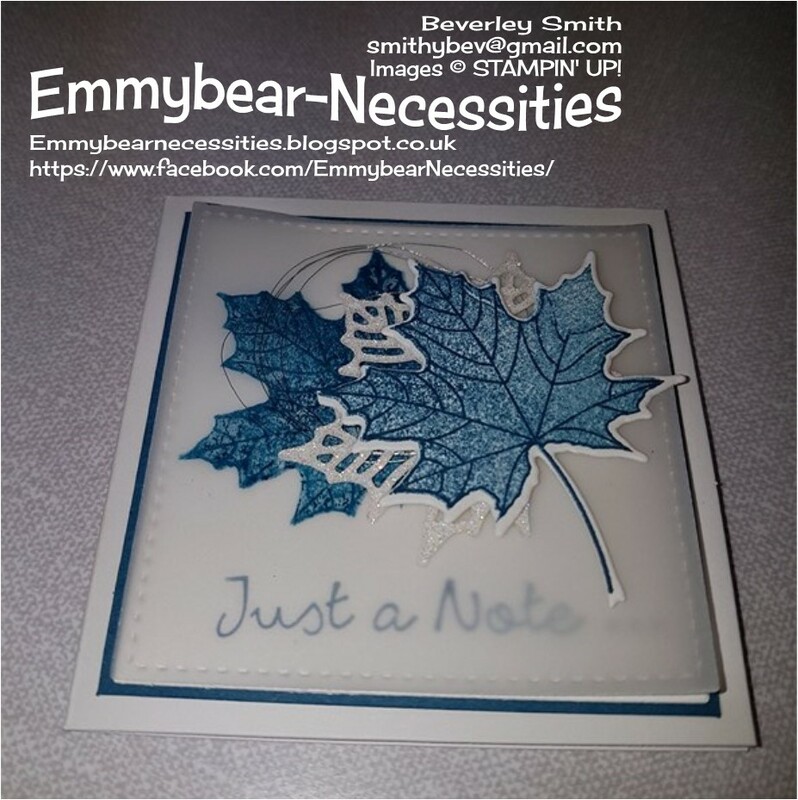 I stamped the leaf and outline onto the vellum which gives a slightly softer look as well as Whisper White which was die cut. The skeleton leaf was die cut from Dazzling Diamonds Glimmer paper. I chose to stamp my sentiment directly onto the Whisper White. The vellum was attached to the card beneath the arrangement of leaves so the adhesive didn't show through. Loops of silver thread were secured behind too. The pizza style box was based on my previous box, though the sides were stuck down slightly differently. As ever, I worked it out as I went along so have no instructions, sorry. For the decoration I added more leaves and finished it with a small bow.